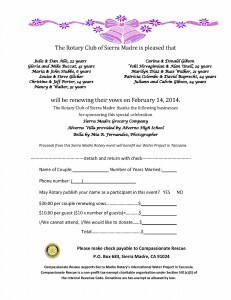 Posted 2/11/14 – Nearly a dozen couples have signed up to renew their vows this Valentine’s Day, and you still have time to join the crowd. 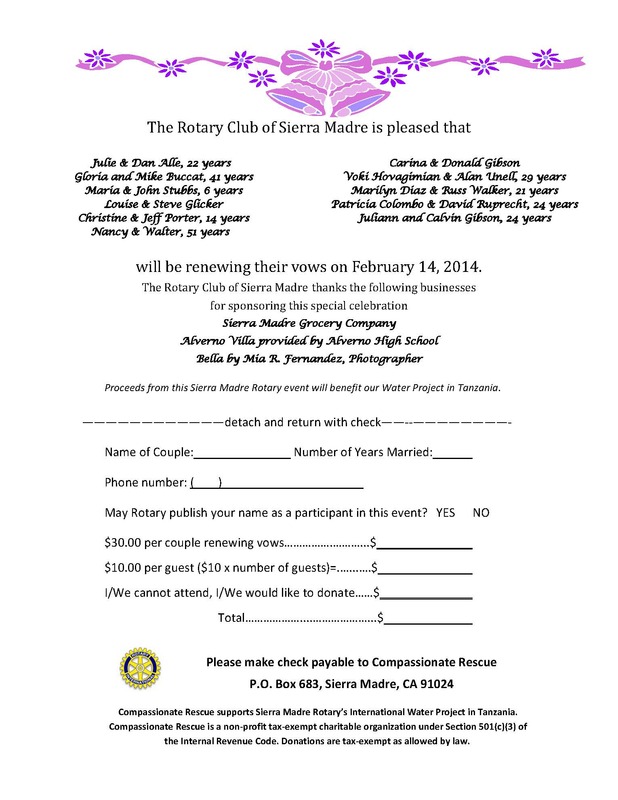 Friday at the Villa del sol d’Oro on the campus of Alverno High School, Sierra Madre Rotary is hosting a Wedding Vow Renewal event, for couples that have been struck by Cupid’s arrow. Eleven couples have already signed up, ranging from six years to 51 years married. Couples will renew their vows as a group (sorry, no self-written vows at this ceremony). Cost to participate is $30/couple and $10/guest, with proceeds benefiting Compassionate Rescue, Sierra Madre Rotary’s International Water Project in Tanzania. Witnesses are encouraged, so long as they recognize there will be a $10 fee to attend, and whether they know someone renewing or not. Guests/witnesses are asked to dress appropriately. Following the ceremony, there will be cakes or cupcakes supplied by Sierra Grocers, and sparkling cider provided by Albertsons. The special occasion begins at 5:30pm, and will be complete by 7pm. Members of Interact and Alverno students will be assisting. Bella by Mia R. Fernandez, photographer will be on hand, and couples will receive a commemorative photo by e-mail. To participate, click on the form at left, print and follow the instructions on the form.